The new station, located in Prague, is the first salvo in what is to become “a much closer co-operation of CEZ and McDonald’s,” Pavel Cyrani, a CEZ board member in charge of strategy, said at the opening ceremony. 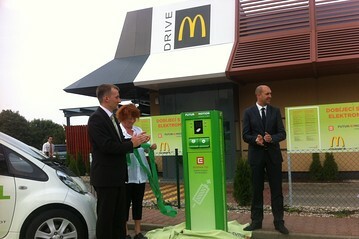 CEZ has worked on building a backbone network of electric car charging stations in the Czech Republic. Partnering with McDonald’s which operates a total of 90 outlets across the country, is part of CEZ’s electric mobility strategy. “McDonald’s restaurants aren’t only in cities but also on highways and often within distances reachable by most electric cars,” Mr. Cyrani said. In 2011 when entering the electric car charging sector, CEZ said it would like to open 50 stations within two years. Most charging stations the company has opened so far are located inside compounds of other companies which began using electric cars for their employees.